With this bracelet from the prestigious Folli Follie you can express your feelings to your loved way in the most original way, with 3 distinct bracelets joined together by 3 rings. The best thing about this gift is that each bracelet has its own colour, the first bathed in gold, the second in silver and third in rose gold. The rings combine with the colours of the bracelets, whilst the central ring is incrusted with crystals to add a touch of sparkle. This bracelet makes for a perfect surprise gift; we promise that she won't be left disappointed! Why send just one bracelet when you can send three? 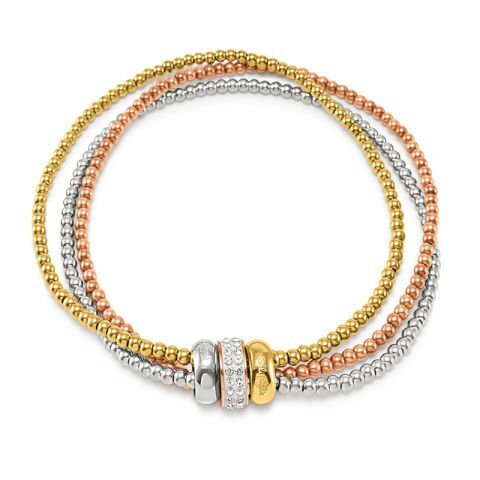 This original, modern design combines three seperate bracelets, plated differently in gold, silver and rose gold joined by three rings of the same colours. This daring design has created a gift which never fails to delight the recipient.